UK start-up Musaic unveils wireless hi-fi system at CES 2014 | What Hi-Fi? The show may be over, but there are still a couple of stories we picked up at CES that are worth reporting. British start-up Musaic unveiled its new wireless hi-fi system, due for release in mid-2014. It's the brainchild of Matthew Bramble, formerly engineering head at Cambridge Audio. 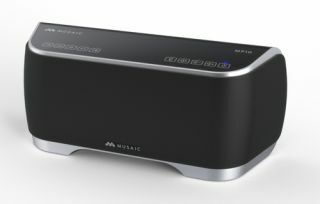 The Musaic system will include wireless music players such as the MP20 (above) and MP10 (below) shown here, and a home server. The system will be able to play music from Apple and Android devices, Macs and PCs as well as UPnP and DLNA servers. It will also support iTunes, Windows Media Player and "the latest streaming apps", says Musaic. There's a party mode to play the same music throughout the house, and built-in internet radio too. Matthew Bramble says: "Musaic is a great sounding system that's easy to use, and we have a number of very exciting features that we can't wait to talk about." He adds that so far, Rhapsody, Napster, Grooveshark, iHeartRadio and SomaFM have signed up to be part of the Musaic offering. TuneIn and Aupeo! will also be included. Technical highlights of the players include Ethernet, wi-fi and AptX Bluetooth connectivity, along with the ability to play hi-res 24-bit/192kHz audio files. File formats supported include MP3, AAC, FLAC, ALAC, AIFF and WAV. We'll bring you more info as soon as we have it.